Illinois Space Day Exposes Young Visitors to "Space, the Final Frontier..."
An Illinois Space Day visitor looks through a telescope. "Space Travel Is Out of This World!" 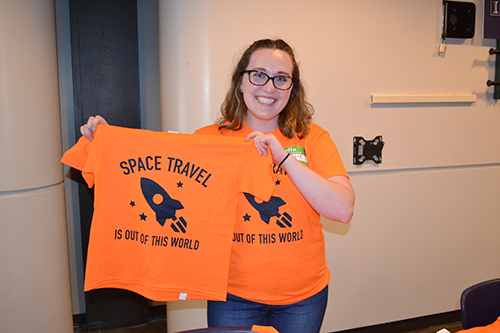 This was the message, emblazoned across the front of the event's bright orange t-shirts, that Aerospace Engineering (AeroE) students participating in Illinois Space Day (ISD) sought to convey to the 150+ young people and family members who showed up for the October 6th outreach. 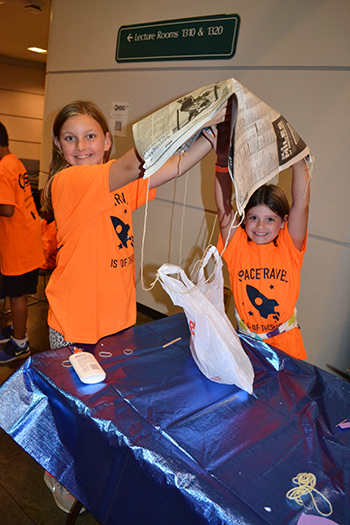 Hosted by the Illinois Space Society (ISS) along with other AeroE organizations, the fun-filled day featured all kinds of space-related activities. For instance, participants could view exhibits of various rocket designs, marvel at demos where things were heated with a blow torch or frozen with liquid nitrogen then shattered, plus participate in numerous hands-on activities, such as designing and testing a rocket or participating in an egg-drop competition. Two young visitors show off the parachute they built for the egg drop activity. Previously this event had been intended for K-8 students, but this year ISS expanded both their projects and activities to include high-school-age students as well. One of the most popular activities was the egg drop competition, where teams of 3-4 members would build a contraption to house an egg, then drop it from a predetermined height—basically three stories—to see if their design enabled the egg to survive the fall! Not only was the egg drop a fun, creative experience, it also taught students about the effects of rapid deceleration and gravity. Another fun activity was a station where children of all ages could draw their version of space. Drawings were displayed behind the booth and formed a beautiful, colorful mural of all sorts of colors, none of which were even close to black. Drawing both allowed kids to flex their creative muscles and also showed them just how vast space can be. After all, if 50 unique drawings can’t capture all of it, how can anything? ISS PR manager Natalie Pfister shows off the t-shirt they designed for ISD. 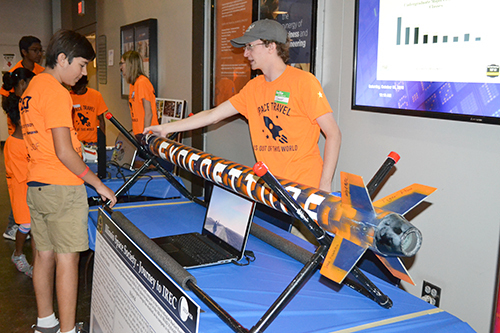 A member of Illinois Space shows a visitor the rocket they built for a competition. “In third grade, I did my project on black holes because I've always loved space, but I actually didn’t know aerospace engineering was an option until my junior year of high school.” Events like ISD can help inform students that no matter what interests or hobbies they might have, there will be a career path for them. 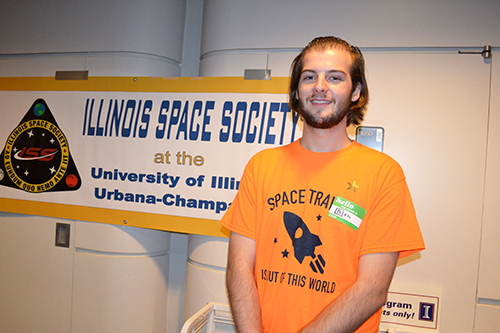 Illinois Space Society Membership Enrichment Director, Ben O'Hearn, at Illinois Space Day. Hudson Riehl watches as his two sons build spacecraft during ISD's Lego hands-on activity. A local family enjoying Illinois Space Day. Illinois Aerospace students do a demo for a group of visitors. All in all, ISS’s Illinois Space Day was a great success. Many children had a lot of fun and everyone there learned something that they didn’t know before. Making science fun to learn is a great way to get kids interested in it as a field, and ISD more than makes it fun; it makes it cool! Whether through drawing the night sky or protecting eggs from the forces of gravity, kids learned a lot about how the world around them works, and some may have been inspired to think about becoming a space scientist when they grow up. In any case, one important lesson should be taken from Illinois Space Space Day: reach for the stars! 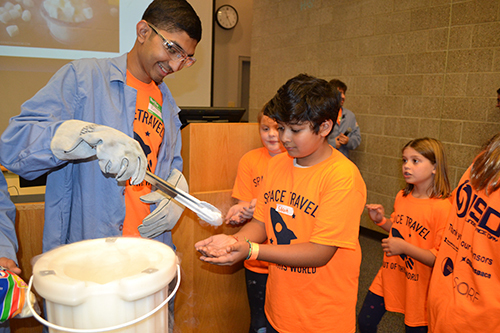 An Illinois Space Day volunteer dishes out marshmallows frozen in liquid nitrogen to young visitors. Story by Nick O'Connell. Photos by Betsy Innes, Communications Specialist, I-STEM Education Initiative, unless otherwise noted. 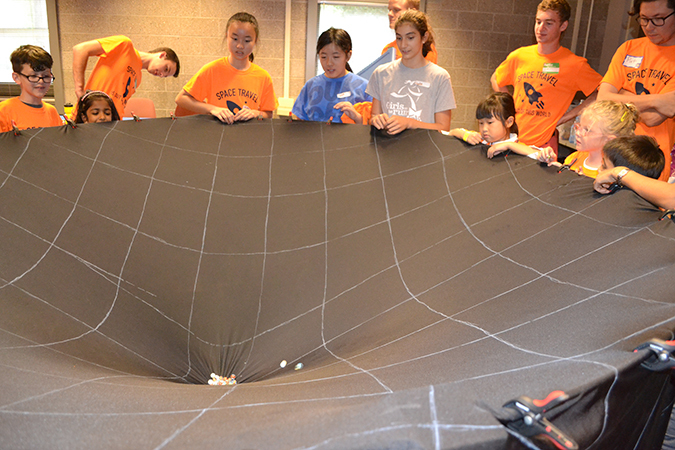 Visitors at Illinois Space Day learn about how orbits decay.